Lani, 23 married Josh, also 23 in the Fall of 2006. Oddly enough, Lani has gotten dressed in a wedding gown, headpiece, veil and satin shoes three times since then … and she’s still happily married to Josh !! Josh too has had his share of suits, tuxedos, top hats and tails. What in the world is going on here? If you were at the Salute to Israel Parade on Sunday, you might have guessed correctly. Here’s the scoop. Lani and Josh, both native New Yorkers, met in college in the winter of 2005, after they each spent a year studying in Yerushalayim following high school. At the Salute to Israel Parade in June, 2006 Josh asked Lani to marry him. She said Yes. They posted all the photos of the event on www.OnlySimchas.com. (Some say that if your engagement is not posted on OnlySimchas you’re not officially engaged!) They were married five months later. Lani got her stunning gown and all her accessories at Bridal Secrets* in Cedarhurst. (Cedarhurst has earned a reputation for being “the hub of the tri-state area for the fashion conscious Orthodox woman.”) She even got a job working there part time. The experience was absolutely amazing … one she’ll never forget. 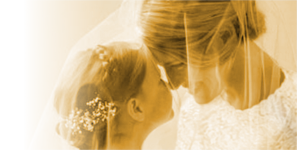 You can read all the wonderful testimonials and see the fabulous brides on www.Bridal-Secrets.com (don’t forget the hyphen!) or by clicking their ad on OnlySimchas. Unfortunately, the photographer called the happy couple a few weeks after the Simcha to let them know that something was wrong with the camera during the ceremony. Could they possibly get dressed all over again and go back with him to the hall to shoot the portraits?????? This was highly unusual. But luckily, Lani and Josh are a very sweet couple and Joy Lieber, the Bridal Consultant at Bridal Secrets adores them. So Lani’s gown was cleaned and put back on, flowers were reordered, the hall became available and the pair donned their best smiles to pose together again under the Chuppah. Fast forward to Sunday June 1, 2008. 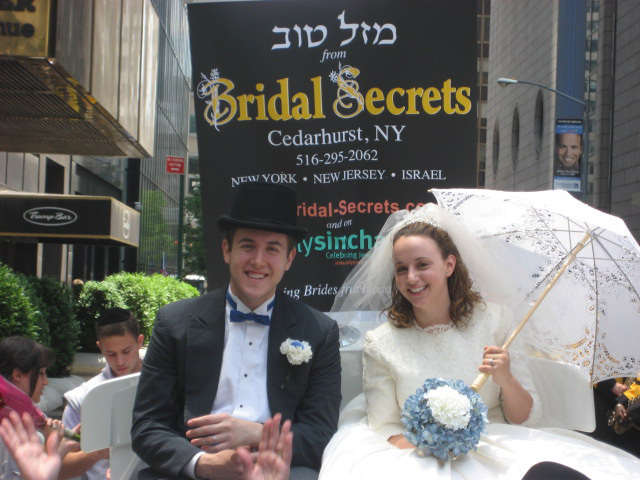 OnlySimchas hosted Bridal Secrets at the Salute To Israel parade ! What a fantastic idea! First came the gang from OnlySimchas, led by Yossi, Dov and Doron. . They were flanked by dozens of fans all in grey and red tee shirts. OnlySimchas has become the pre-eminent site for announcing Jewish celebrations taking place around the world. Founded in 2000, it allows users anywhere to upload picture galleries of their latest celebration within moments of the event. Friends and family around the globe are then able to enjoy and post congratulatory wishes to the celebrants on their message board. To date, OnlySimchas.com boasts over 400,000 photos of Jewish Simchas. Last month, 19 million pages were viewed and 1600 simchas were posted to the site. Also popular is FutureSimchas.com, the fastest growing matchmaking site in the Jewish market. Currently there are almost 4000 profiles on the site from around the globe. Then came the garland strewn white convertible Joy rented with Lani the Kallah and Josh the Chatan (or Chosson) all dressed up once again by Bridal Secrets. What a scene! All this was followed by the towering OnlySimchas mobile ad playing Simcha music behind them. At major intersections the NYPD stopped the parade to allow crosstown traffic to proceed. During that short stop, the OnlySimchas followers danced in front of the couple in full regalia (Lani in an ivory chantilly lace and taffeta ballroom number from the 2008 collection and Josh in top hat and tails). The bride carried a bouquet of blue and white hydrangeas and the groom’s boutonnière, bow tie and cumberbund also matched the Israeli flag. Lani and Josh delighted everyone by holding either end of a handkerchief between them. Could it get any better than this? There were an estimated one million spectators lining Fifth Avenue. They cheered. They sang. They screamed Mazel Tov over and over again. They clapped their hands and stomped their feet in time to the wedding music. They danced behind the barricades and with the uniformed police officers! How appropriate to celebrate the anniversary of the very beginning of a Jewish couple’s new life together at a parade honoring Israel’s sixtieth birthday. The Jewish wedding is the foundation of Jewish continuity. 5,768 years ago, Hashem accompanied Adam to meet Chava in the center of Gan Eden. (see http://bridal-secrets.com/hachnosas_kallah.html) Central Park doesn’t quite come close to Eden but there must be something about the combination of blue and white in the sky that seemed to electrify the air at the parade. As the group passed E. 65th Street Lani, the ‘reining’ bride, motioned to Josh to disembark from their throne on top of the white Mustang convertible. Carrying two dozen red roses, he found a very surprised young lady named Shani in the crowd. As secretly planned over a week ago with Bridal Secrets and OnlySimchas, one very nervous Avi proposed to speechless Shani. She said Yes. Josh handed over the bouquet of roses. The crowd went wild again !!!! (Check it all out on OnlySimchas.com). The parade, once again this year, was followed by a colorful concert in Central Park. Put it all together and the whole day felt very much like attending a huge Jewish wedding with the procession starting down the aisle on Fifth Avenue at 11:00 am and the last dance ending at 6:30 pm. Although hundreds of thousands make it an annual outing, the land and people of Eretz Yisrael are constantly on their minds and always in their hearts. They pray daily for their safety and show their economic and financial support by frequent visits and open checkbooks. But at every single parade you can hear the fervent chanting of these dually loyal American Jews, “L’SHANA HABA’AH B’YERUSHALAYIM”. BRIDAL SECRETS opened its doors in 2002 to meet the growing need of Orthodox Jewish brides, particularly on Long Island, the Five Boroughs and beyond. Since then, hundreds of brides from all across the United States, Canada, Australia and Israel have crossed their threshold to fall in love yet again – this time with their wedding gowns! All of BRIDAL SECRETS’ gowns have already been designed with sleeves and necklines. Each is individually customized and fabricated with alterations done on the premises by expert European seamstresses. Brides either purchase or rent gowns, headpieces and veils made to order or choose from BRIDAL SECRETS’ selection of current gowns and headpieces in stock, just for their one special day. Bridal Secrets is located at 415a Central Ave. Cedarhurst, NY 11516. Consultations with Joy are by appointment at 516-295-2062.